Palestinian amora of the fourth century. He is perhaps identical with Samuel ben Inijah or Inia ( ). Samuel ben Jonah once gave an opinion concerning Samuel ben Naḥman's system of calculating the advent of the new moon (Pesiḳ. R. 54b). 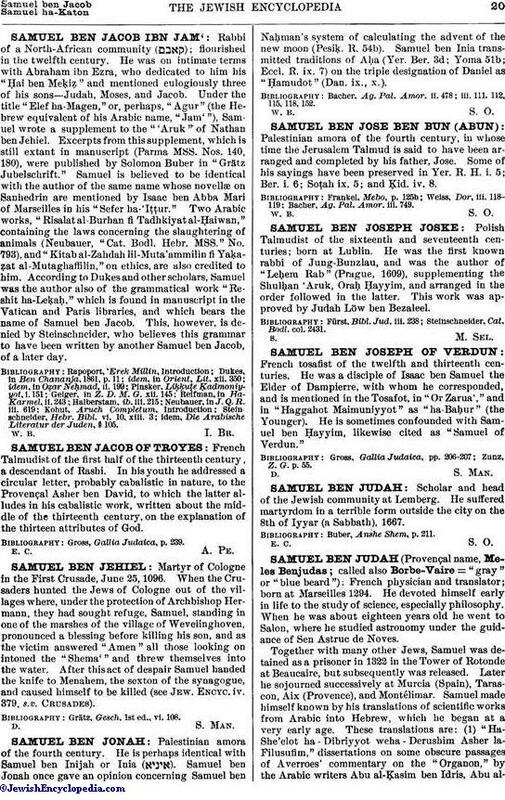 Samuel ben Inia transmitted traditions of Aḥa (Yer. Ber. 3d; Yoma 51b; Eccl. R. ix. 7) on the triple designation of Daniel as "Ḥamudot." (Dan. ix., x.). Bacher, Ag. Pal. Amor. ii. 478; iii. 111, 112, 115, 118, 152.